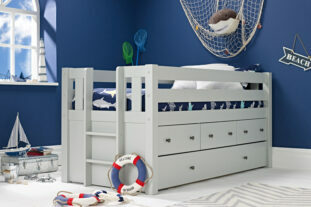 From 6+ your child can enjoy the delights of a cabin bed. With plenty of space under the bed they can create a den and add a fun tent. Or for older children they can add furniture, such as a chest of drawers, bookcase or pull out children’s desks . It is the perfect space to store the copious amount of toys that collect in any child’s room! Children’s cabin beds come in a variety of stylish options, and are ideal utilising limited space, and maximising storage space. Room to Grow offer a varied range cabin beds to best suit your preferences. You may choose a desk cabin bed with a cleverly integrated desk if you want a space for your child to be able to do their homework, or you can opt for a design with various storage space such as shelf, drawers and cupboards to utilise the underneath. There are many designs and colour schemes to fit in, but take a look at our guide to Cabin Beds for more information. with your child’s current bedroom design and preferences, from a stylish minimalist look and feel to vibrant, bright coloured beds with underbed dens that will offer endless fun; the choice is yours! You may also wish to find fun mid sleeper beds with additional exciting features and bright designs to help make bedtime fun. 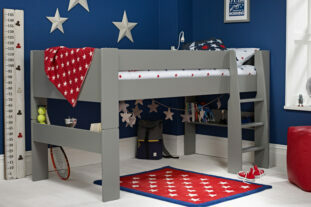 Due to the height of a cabin bed, they are recommended for children over 6. Although models vary slightly, you will find that most designs come with three steps up to the bed which tend to be fairly deep, so that they are safe and practical for children over 6. Extra space underneath can still be used for storage, and by choosing a den, you can cleverly keep the storage hidden away! Alternatively, if you are looking to incorporate furniture you already own, there are a plenty of cabin beds for kids with free space underneath too. 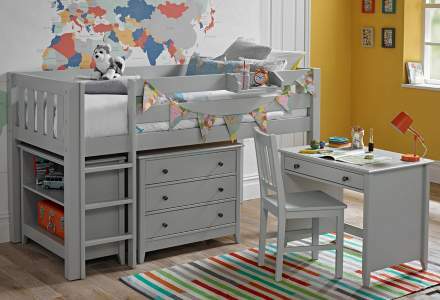 Ideal for over 6’s, cabin beds come in a variety of heights depending on your personal preference and storage needs, all of which offer maximum comfort and are a stylish storage solution, perfect for even the smallest of spaces. 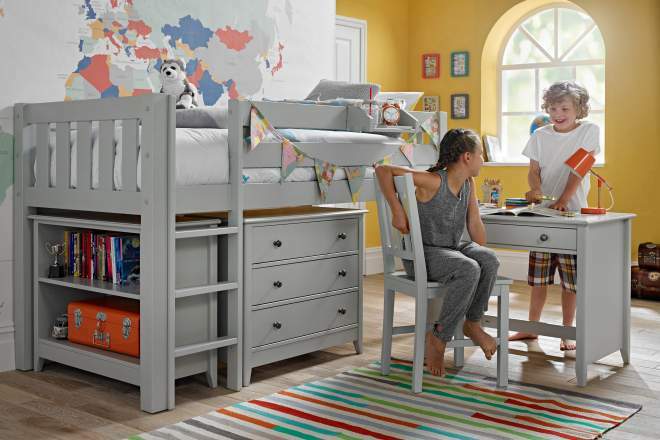 From bunk beds to loft beds, we guarantee you’ll find the perfect children’s bed with Room to Grow today.